In 1997 VSAC found that people who accessed the hospital accompaniment program, over 1 in 3 were ages 13 to 19. From this, the staff and board of directors were dedicated to researching and designing a new prevention strategy. Research done with youth formed the basis of Project Respect. Youth said they needed a program that reflected their realities, came from a variety of sources, and had a simple, positive message. An advisory committee of youth quickly became the driving force of the project. 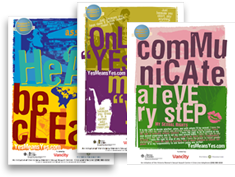 With support from media experts and VSAC, youth helped develop the key prevention messages and social marketing strategy. The theme they came up with was “Communicate…Respect”. After two years of work with local youth, community partners, and experts in the field of sexual violence prevention, Project Respect was launched in 2000. An award winning video created by the youth, a school program, and a website were some of the key components. Since 2001, Project Respect has presented workshops in numerous junior highs and high schools, has attended provincial and national conferences, hosted educational and awareness raising events, and trained many youth to be Respect Revolutionaries in their communities through social action projects.